How do I store my tempeh starters? Tempeh starter should be kept in the refrigerator (33-36 F) in a closed glass jar, or a sealed zip lock bag. Every time you open the refrigerator warm most air will enter, and will condense on the objects in the refrigerator. In a glass jar or zip lock the tempeh starter is protected and safe, and won't get moist. The tempeh starter can be kept in the refrigerator for months, even better store it in the freezer, it will stay potent for years. Will my tempeh starter culture lose strength during shipping? NO, Our tempeh starters are structural design in our labs to withstand the shipping period to your location for months, it will NOT lose their potency, and we guaranty this. On arrival store it in refrigerator, it will stay potent for months, even better in the freezer, you will be able to keep it for years!. See for more information our Tempeh Starter information page. Is our starter the right one ? Some tempeh starters sold in U.S. are cheap, claimed from Indonesia, unknown brand names, but they dont tell you how long they are kept in their warehouses before shipping to U.S. and selling online. Cheap is not always cheap, Raprima and our IndoPal starters are fresh, sealed, and kept frozen before shipping its quaranties you a good starter. Due regulations we cannot ship to P.O. Boxes. What is shelf life of tempeh starter culture? e.g. in a refrigerator, or even better, in a freezer, then it will be active for many of years. How do I store my fresh tempeh? Fresh tempeh can be kept in the refrigerator (33-36 F) for about 1 week. Frozen tempeh keeps good for several months. How much tempeh can I eat daily? There's is no minimum or maximum amount. We only advice that tempeh is part of a well balanced diet. The FDA recommends consuming daily about 25 g of soy proteins, or 2 to 3 oz Tempeh. What soybean varieties are suitable for the production of tempeh? The only beans in our opinion to create the taste of original Indonesian Tempeh are Yellow Soy Beans, although there are no specific varieties which could be used for the production of tempeh. 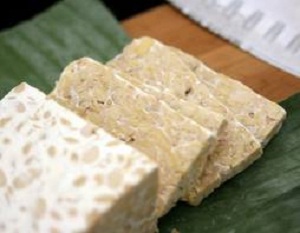 To obtain the "fresh nutty taste" of Tempeh only the big yellow Soy Bean should be used, if you want to use instead of Soya Bean, an other kind of bean, this is no problem in the process, it only gives a different taste then Indonesian style tempeh. 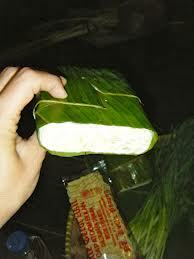 Fresh tempeh is eaten cooked, either fried, steamed or boiled. How do I know that my tempeh is good? In fresh tempeh the soybeans should be bound together into a tight cakes with no mold growing other than the white tempeh culture. Small black spots may occasionally appear. These spots do not necessarily indicate spoilage, but are part of the tempeh culture's life cycle. The texture should not be slimy and the aroma should be mushroom-like (or nutty yeast-like). A every slight smell of ammonia is normal. This smell will increase if you incubate the tempeh too long, indicating that the proteins have been broken down too much. My batch of homemade tempeh is spoiled, who can I prevent this in future? There could be many reasons but the most important one is the incubation of moist beans. Moist is the number 1 reason which will spoil your batch of Tempeh. Then other organisms will grow and compete with the tempeh mold. This will result in a slimy texture and a strong smell of ammonia. - too high incubation temperature which kills the mold (temperature should be 86 F). Molds can produce toxins! How safe is tempeh? The molds (Rhizopus) used for the production of tempeh are eatable and don't produce any known toxins. My tempeh has some black spots! Can I still use this tempeh? The formation of black spores, especially around the air holes, where there's a lot of oxygen, the molds could produce some black spores. This tempeh is still eatable, and is normal. To Indonesian people black spores are a sign of a good tempeh(maker). Depending on the Rhizopus strain could will happen sometimes after 2-3 days of incubation. To produce white tempeh, carefully follow our instructions,if the temperature is too hight or incubation time too long this could happen, our spores strain produces perfect tempeh, if directions are followed. Black Oncom more recently referred to as onchom, one of the staple foods in Asia, and is a culture food-product closely related to Unlike tempeh, oncom is mainly prepared from Okara (Okara Japanese], a byproduct of manufacturing soy milk. Our instructions will show you how to make it, and your byproduct will be delicious healthy FREE Soy Milk. A mold species which produces Oncom, is used in the short fermentation of oncom. In contrast to tempeh, sporulation of the mold is encouraged in oncom production. media, and Rhizopus Oligosprus spores which is produced by PT. Aneka Fermentasi Industri (AFI) from Bandung, West Java. control such products in order to protect the consumers security and health in the country and overseas. administration, organization and governance, officialdom, finance, archives, coding, equipment and household. and other products to reassure the consumers' mind in consuming the product. Is Raprima Tempeh Starter Safe To Use? right there is a "HALAL" label from Indonesia Ulema Council "MAJELIS ULAMA INDONESIA" with product number LPPOM 01311082190113. Where To Buy Tempeh Starter? anytime you need. We provide it start from retail purchase of small party or in bulk, even wholesale. The lamp fixture should be on the bottom at one side of the ref. for random heating. Most refrigerators have a hole at the back (for the cable, lines or to let the condense out) which you can use to pull out the electric cord, otherwise you will have to drill a hole. It's important to check the temperature during incubation because tempeh , especially at the end of the fermentation process, will produce its own heat. The temperature of the incubator should be between 85-89F. You can controlling this by adjusting the dimmer button. Remember that the most import mistake for spoiled tempeh is too high temperature, too much moisture, or not working clean. If you want to invest a bit more you can install a digital thermostat and a ventilator to control the temperature and the environment. Use a cardboard of about 3' x 6' x 3' ft or larger. Isolate the outside of the box with polystyrene foam. Put the carton in the upright position and place a light and dimmer at the bottom, Create rack on the inside for the tempeh Electric oven Modern electric ovens not working well, do not use them, just use the oven as warm place, and put a hot water bath inside to keep the temp around 85 - 90 F. No incubator Of course you don't need an incubator if you live in a warm place where the temperature is ideal for growing tempeh. Tempeh originated from Indonesia with a warm climate the whole year round is solely made by just putting the tempeh outside, the wind and the temp. will do the rest. How to make Tempeh in bananaleaf? Simple clean your bananaleaf, wipe it dry, punch at every 1/2 inch of the leaf a hole. Spread the soybeans evenly on the leaf and folt the leave up. ( like a spring roll ), put some toothpicks to hold it all together, and transfer to your incubator, and your done. Tempeh in Indonesia is most of the time made with bananaleaves, the taste is very different and delicious, its worth the work. We offer Debit,Credit Cards,Paypal Payments, Western Union/MoneyGram at checkout. Our Tempeh Starter stays potent for months and years! Shipping depending on location Visit our F.A.Q. section for more Information and Questions.